Every Tuesday, we craft, have a cocktail, and enjoy each other’s company at Too Cute Tuesday. To learn more, check us out on Facebook, check out our archives, or start a Too Cute Tuesday chapter in your town. 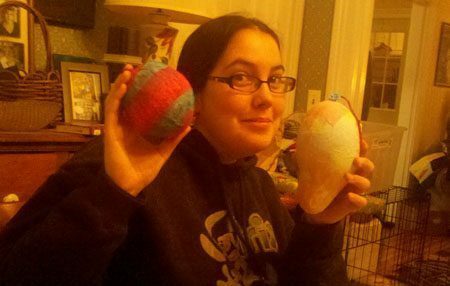 While I was on my vacation, I got an email from Dorrie about a great Christmas craft for when I got back: paper mache Christmas ornaments. Sam has some nice paper mache ornaments, though one is in a slightly less than traditional shape for the holidays. I had some fun stories to share from Vegas (not everything stays there!) and while I was gone, apparently some of my Too Cute Tuesday friends won door prizes at our local merchant’s sale. Good luck all around! 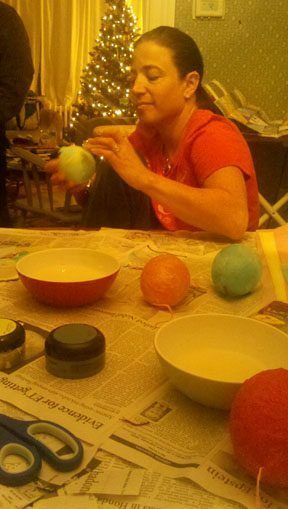 Dorrie layers on the magic… but we’ll have to let things dry before we pop the balloon. 1. Blow up a balloon in a smallish, roundish shape. 2. 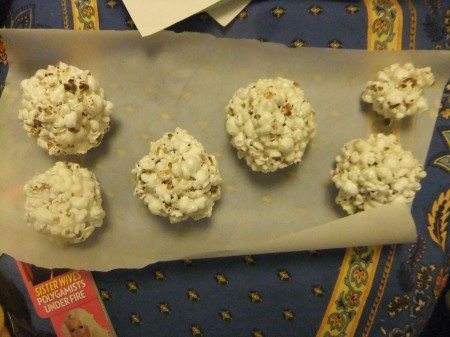 Using the paper mache mix, dip newspaper and/or tissue paper and slowly cover the balloon. 3. 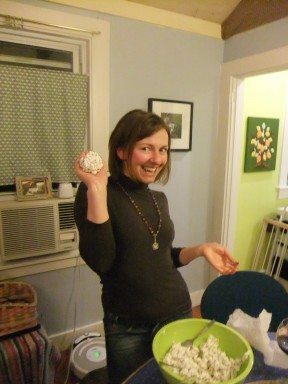 Tie the floss around the balloon nub (Nicole patented term) and cover that with paper mache. 4. Let your product dry (or expedite the process by using a blowdryer). Add glitter, markers, and other decorations to finish things off. Once dry, you can pop the balloon and hang in your tree… or pass this off as a Yankee Swap gift or ornament swap, like I will try to do later this week. Aren’t you crafty? And festive for the holiday season! Too Cute Tuesday is a weekly event involving a craft, cocktail, and friends. To learn more, check out toocutetuesday.com or check us out on Facebook at www.facebook.com/toocutetuesday. Every year, we make Christmas cookies from Dorrie’s grandma’s recipe for annual sale at Dorrie’s store. Every Tuesday it’s a craft, a cocktail and friends. Love being crafty? Join us on Facebook or check out our archives, like our ‘recycle’ crafts. You know it’s been a busy week when you are writing a Tuesday blog post on a weekend! This week though, we did craft on Tuesday following the suggestion of TCTer Meg to make dresses out of pillowcases as part of the Little Dresses for Africa program. Sam and Dorrie were back to craft and Sue and Dan were also excited to sew. It was nice to have a crowd of people and dogs again! Even with us having to hand sew, the crafting only took us an hour. And for five dresses we can send to Africa, that’s a pretty productive way to spend a social fall evening. A fun craft for a good cause? We’re totally there. 1. Take pillow cases and fold down the middle lengthwise. Cut the arm holes 2-4 inches down from the top. 2. Fold the top down to where the sleeves start. Sew the bottom down to create a little pocket to thread the ribbon through. 3. Put ribbon through. Tie. Try it on if you are bold like Dorrie. Every Tuesday, it’s a craft, a cocktail, and friends. To join the fun, check out the Facebook page and the Too Cute Tuesday archives. Feeling a little lazy? Check out the ‘five minute’ crafts here. Halloween is coming up and it’s time, in the eleventh hour, to plan some last minute costumes. So I invited the Too Cute Tuesday crew for some white wine and some costume planning. Now traditionally, Halloween costumes are scary but they no longer have to be, at least stateside (the UK, I’ve been told, is still into the more traditional Halloween garb). You’ll have to wait until Halloween to see actual pictures but I know I am personally relieved to not be running around on Saturday figuring out a costume. Road- Dress in all black and put a yellow dotted line (like with electrical tape) down the middle of your body. Print out road signs and stick them strategically. Think ‘Curves Ahead’, ‘Do Not Enter’, etc. Cave woman: Using various animal print fabrics, sew together a tattered dress. Tease out your hair, carry a club and do a little brown makeup (dirt-like) streaking, if so moved. Geisha: With silk bathrobe, powder face white and put hair in bun on top of head. Add sandals and clever makeup, if desired. With short black dress, add white apron. Add small hat (Christie apparently makes a good one), white tutu, fishnets, heels and feather duster. French accent optional. Looking for more ideas? Readymade has some good costume ideas you can make. Like ‘cereal killer’ and ‘American tourist’! Aren’t you crafty, and excited for upcoming holidays? Every Tuesday, it’s a craft, cocktail, and friends. To join in the fun, follow Too Cute Tuesday on Facebook, check out the Too Cute Tuesday archives, or start your own chapter. It’s an October tradition at Too Cute Tuesday. Pumpkin carving is back again this year. Last year, Englishman Phil joined us and this year, Germanlady Michayela came with Jen. Next year, we’ll need another European visitor to join us for luck. Friends in the EU, stand by for 2011. We might need you! Jen brought Michaeyla to take part in this fine American tradition. 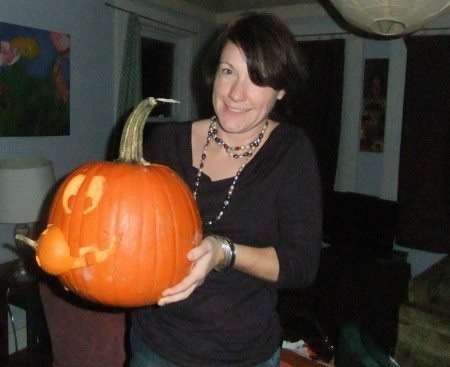 Jen and her carvniverous pumpkin. We all enjoyed a little pumpkin pie, Sue included. 1. Cover table with newspaper and take out your ridiculously small pumpkin. 2. 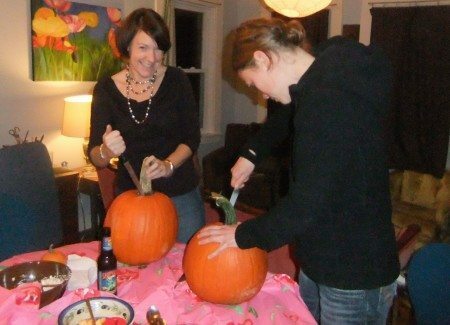 Have friends arrive, bringing pumpkin pie, happiness, and their much larger pumpkins for carving. 3. Cut top off pumpkin and scoop out the guts with a large spoon. Put them in a big bowl. You can separate the seeds out later. 4. Carve design into pumpkin you want. Some TCTers have pre-researched. Jen goes with a carnivorous pumpkin (eating a gourd) while Michayela and I went with more traditional designs. 5. Pick seeds out of pumpkin guts and rinse in cold water. Place on a cookie sheet at toss with oil and spices of your choice. Roast in the oven for about 40 minutes, turning every 10 minutes. 6. While seeds are roasting, place candles in pumpkins and take a few proud photos. Overall, we had some good final products and carving pumpkins is fun and easy (if you can get over the mess). Aren’t we crafty, and ready for Halloween? Got to love crafts that work in the dark!